Get hooked on fun with this one-of-a-kind fishing kit! 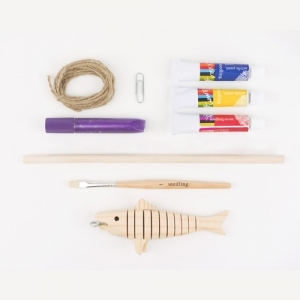 This DIY kit includes everything you need to design your own finned pal and create your own magnetic fishing game, including artist-quality acrylic paints, glitter, and a wooden fish and pole. Make a go with catching that big game! 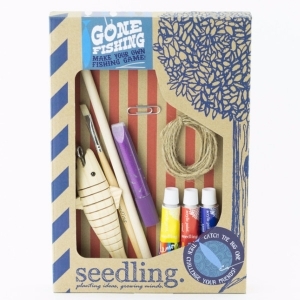 This Seedling Kit includes: Wooden Fish, Glitter Glue, Acrylic Paints, Paint Brush, Wooden Stick, Twine, Paper Clip and Instructions. Recommended for ages 6 - 8 years. There are currently no customer reviews for this product. Add one below! If you've tried this kit, please let us know how it went. We'd love to know what you made! Reviews will appear on the site within 48 hours once approved. All rights reserved - Good Things for Kids. Website design by Designer Websites.